Rasha Shrourou, 22 years old from Syria raised in Saudi Arabia is studying for an Architecture degree in the School of Architecture and Built Environment at the University’s City Campus in Wolverhampton. The event was hosted by the Birmingham Architectural Association and the Royal Institute of British Architects (RIBA) West Midlands at JQ Design Destination to celebrate women in architecture in the West Midlands region, showcasing talent from local universities as well as local practices. 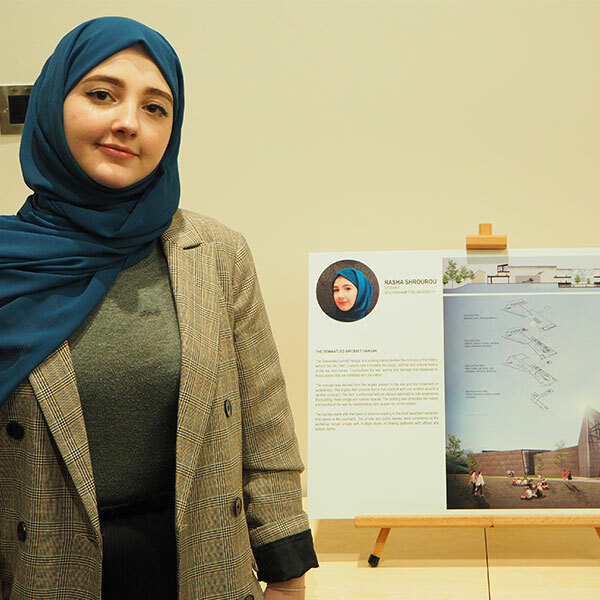 Olive White, Lecturer in Architecture at the University, said: “Rasha took part in the mini-exhibition celebrating women who have positively contributed to the built environment of the region. “The exhibition included various projects in the region, past and present, which have been spearheaded by female architects and future architects. Rasha said: “It really was an honour to have been invited to exhibit my work at such a high profile, prestigious event celebrating the achievements of women in architecture. Anyone wanting to study in the School of Architecture and Built Environment should register for the next Open Day on Saturday 15th June 2019.